Following up on her September interview in Mental Health Practice, Felicity Stockwell’s bemoans how little it has changed mental health nursing practice. Following up on her September interview in Mental Health Practice, Felicity Stockwell bemoans how little her work has changed mental health nursing practice. For many nurses, Felicity Stockwell’s study, The Unpopular Patient has changed nursing from task-based to patient-centred care. But she is still waiting for it to have an impact on mental health nursing. When the RCN started its research project, Study of Nursing Care, in 1966, I was not eligible to take part because I was a mental health nurse. The project was to develop the quality of general nursing. However, because I was in the RCN, and had been invited to participate in an informal nursing research group for senior nurses I was included, even though I was a mental health tutor. It was for this project that I wrote The Unpopular Patient, published in 1972. In 1959 when I started my mental nurse training I was taught when mothers nurture and care for their babies all the sensations the babies experience set up needs for the pleasure they gain for the rest of their lives. Anxiety is aroused if these needs are not met and mental disorder can develop. When I was interviewed for Mental Health Practice’s September issue I said that my study has not done 'one iota of good'. This is because I had hoped the status it has given would encourage mental health nurses to listen to me so that they can understand how it is that failings of the full bonding process in babies makes people vulnerable to knocks to their self-esteem, and gives rise to behavioral disorders, and how socially enabling care is a most effective way to restore self-confidence and contentment. Later in my career I worked as a ward sister at St. Thomas’s Hospital, where psychiatrist, William Sargant worked. At the time, he was a prominent figure for treating mentally ill patients physically, rather than socially. His treatments such as electroconvulsive therapy and insulin shock therapy were deemed successful, although unpopular with his colleagues. Many of the nurses believed and stand by that fact that social care, listening and talking to the patients helped improve their mental health. When I finally began working in mental hospitals I found it upsetting because the nursing care was different, and not based on a social strategy of care. I realised what a shortfall there was and I vowed to reform mental health nursing. That was in 1963. Through attending RCN monthly meetings, I made friends with a nurse who was doing research with the King's Fund, and shared my concerns about mental health nursing with her. It was she, who introduced me to Winifred Raphael, an occupational psychologist who wrote surveys on how patients view life in hospital. Raphael ran a research discussion group for senior nurses. I embarked on a strategy to share the benefits of social caring with current mental health nurses. In 1972, The Unpopular Patient was published – and seriously repudiated – I was married with two daughters, and decided that fate did not mean me to reform mental health nursing. We moved North and when my daughters had started school, I was persuaded to work as a tutor at Whittingham Hospital in Preston, Lancashire. My colleagues knew about The Unpopular Patient. The Sun newspaper ran a front-page story stating that I didn’t like patients. This did not endear me to my new colleagues, and none of them would listen to anything about maternal bonding, but I used experiential learning techniques to teach psychology again. This had the same negative reception in the wards and with my colleagues. In 1987 my husband died, and I was old enough to retire. It was when visiting someone in hospital, that I came to hear that The Unpopular Patient was now acclaimed, and I was popular. This re-awoke my determination to reform mental health nursing. Since that time, I have used my fame to contact as many practising mental health nurses that I can, to try and explain the value and strategies of enabling social care based on understanding maternal infant bonding. And explain how easy and rewarding it is. I still await somebody taking an interest. I do realise my dream is a hidden agenda, but every time continuing interest in the study surfaces it hurts that I have not been able to use the publicity to promote it successfully in mental health nursing. Released in 1972, the study was controversial because it suggested that if a patient may have been ill-tempered or uncooperative they were deemed ‘difficult’ by nurses. It was suggested that ‘unpopular’ patients like these did not receive the same level of care as others. 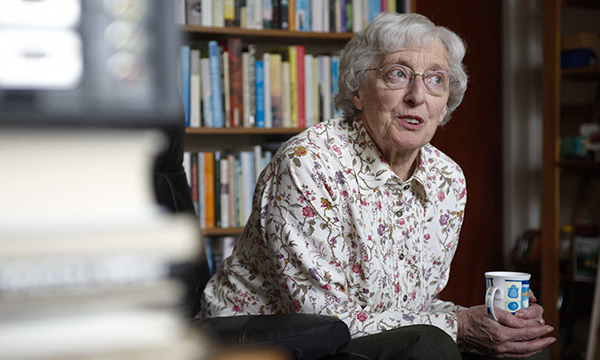 Felicity Stockwell maintained that social care – such as listening and talking – was the best way of treating patients, and believed that mother-infant bonding was the foundation for positive mental health.